Maintenance: Who Ya Gonna Call…? No, it’s probably not the Ghostbusters (and that reference just went over the head of half my audience…). But if you do spot a problem while out riding, there are a number of options you have for making sure things get done. We’ve all come across it before: there you are riding along and suddenly you find a big pile of gravel right in your path. Or maybe it’s an illegally parked car blocking your progress. Or maybe your cycle crossing light seems to be broken. Or… you get the gist. Now perhaps you’ve just gritted your teeth, cursed inwardly, and crossed your fingers that the problem will be gone the next time you go past this way (or maybe you’ve just penned a blogpost about it…). But of course it will only get fixed if someone knows about it, so why not take some positive action? 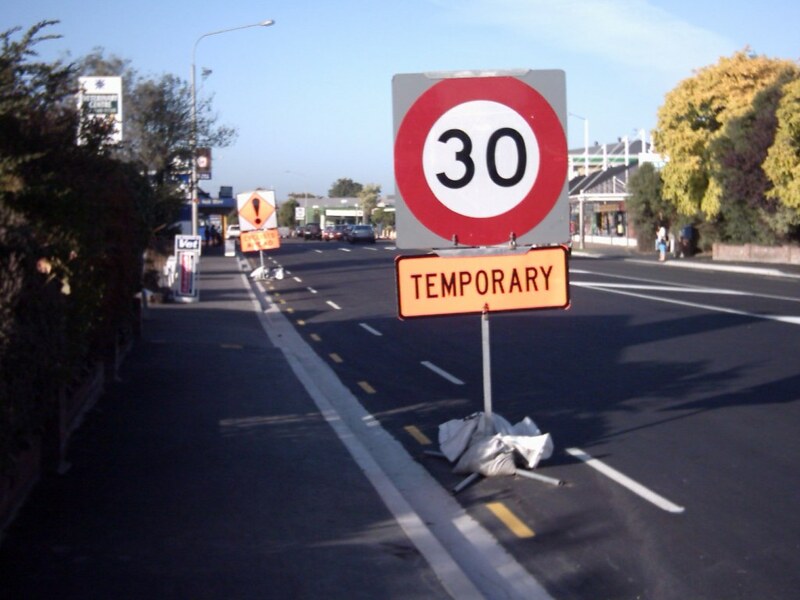 For Christchurch City local streets or paths, call the City Council on (03)941-8666 or 0800-800-169, or email streets[at]ccc.govt.nz, or you can use their online service request form. On State Highways (see map of where they are), contact NZTA on 0800-444-449 or use their online complaints form. In Selwyn District (Prebbleton, Lincoln, Rolleston, etc) phone (03)347-2800, email helpline[at]selwyn.govt.nz, or you can submit an online request. In Waimakariri District (Kaiapoi, Rangiora, Woodend, etc) phone (03)311-8900, email office[at]wmk.govt.nz, or you can lodge a service request online. Many roadworks sites will have an information board somewhere giving contact details for the contractor involved. If all else fails, ring the Council call centre (03-941-8999) and tell them the location of the site; they will either take the query and pass it on, or provide you with the number of the contract team to call. It’s usually fairly important to get the location precise enough; “about halfway down Riccarton Rd” ain’t gonna cut it. Look for a nearby house number or side-street or some other feature. If you have a digital camera (or camera-phone) handy, this can be an even better way to explain a problem in pictures instead of just words, and show more specifically where it is. I’ve found that generally the response to things that need fixing/sweeping/etc is pretty quick (e.g. hours or days), especially if it’s clearly hazardous (mention “safety hazard” if you want to get some faster action). Other minor “wish-list” improvements are often dealt with as part of regular minor maintenance works every few months. And bigger projects will at least get added to the pot of things to consider when planning annual programmes. Another clever way to report problems out there is to use FixMyStreet. Developed right here in Chch by some clever techno-bods, this website allows you to report any kind of street issue and it will automatically be sent to the relevant RCA anywhere in the country (great when you’re on holiday!). You simply find the location on a map, enter some details about the problem (you can even upload a photo), and then it’s sent off to the powers that be. Simple! Even better, the site also lets you know when it’s fixed. For the techno-mobile amongst you, there are also FixMyStreet apps for iPhone and Android – snap a photo, write some comments, and the phone’s GPS will do the rest! Another satisfied customer: FixMyStreet also lets you know when the problem has been resolved. Handy suggestion: Often by the time I’ve got to my desk I’ve forgotten about the cycleway problem I spotted on my way to/from work and hence forget to do anything about it. So I set up in my Outlook calendar a daily reminder that popped up and asked me if there was anything I needed to contact Council or someone about! I’d encourage all of you to let the relevant agencies know about any street/path problem you have, be it a maintenance issue, a hazardous site, or an idea for how to improve something. After all, it’s your taxes and rates that are paying for these things! Great post. I particularly like the idea of a Fixmystreet app where I can send off info immediately. Sometimes I wonder if its the case of the squeaky wheel getting the desired response. I ‘squeaked’ to NZTA about the offroad cycle way along the christchurch southern motorway. Great resource but the section between Barrington Street and Wrights road is in gravel. I queried this to NZTA and they confirmed it would be done (subject to weather) but so far has not been. Anyone else who uses this, please contact NZTA, and hopefully they’ll get onto it sooner rather than later. Nick, I’m not even sure who’s ultimately responsible for this pathway, seeing as the City Council paid for it (but presumably it’s part of the NZTA motorway contract). We’ve raised this issue with CCC as well and I can’t believe it’s dragged on this long either. After reading your post, I used FIXmystreet, knowing that it would go to the City and asking them to ask NZTA as well. PLus I emailed NZTA again. The same day I got a call from NZTA contractors asking about the issue and the next day after that contractors were on site preparing the path for sealing! I installed the fix my street app for iOS but it doesn’t seem to work 🙁 it would be a handy thing. 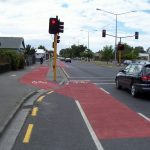 Previous Previous post: Will Christchurch be an Accessible City for Cycling?